You’ve written haiku – now try haibun! 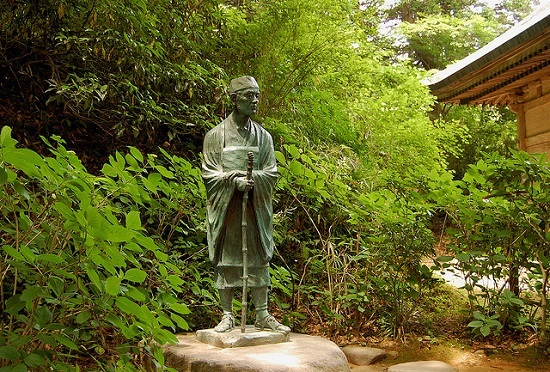 Matsuo Basho, born in 1644, was from a minor samurai family near Kyoto, the old capital of Japan. He had six brothers and sisters. As a boy, he studied linked verse (renga), a collaborative sequence of poems (each 5 lines of 5-7-5-7-7 syllables) linked by witty associations and word play. But by Basho’s time, the first 3 lines had also become an independent unit called hokku or haiku, and Basho worked all his life to deepen and widen the scope of this little form. In his twenties he studied Japanese and Chinese poetry, then moved to Edo (now Tokyo) where he met Soin, founder of a school of poetry which favoured plain language, everyday subjects and humour. He began taking students and collaborated with other poets on sequences of haiku. He also worked as an official in the water company. Around this time, he shaved his head and became a lay monk, practising Zen meditation under the guidance of his friend and priest, Buccho. He moved to a modest house on the outskirts of town, where one of his students gave him a banana tree (basho) which he seems to have loved and taken as his pen name. By his forties, he was a famous poet and teacher, but he tired of this life and started travelling – in the tradition of religious but also literary pilgrimage, so he would visit temples and shrines, but also some of the places associated with poetry, a process the Japanese call ‘uta makura’, literally ‘poem pillow’ but better translated as the ‘poem road’. He generally travelled with a companion, on foot, horseback, boat, taking very little except his writing brush and some clothes. The last and most famous of these journeys was in 1689, to the rough and untravelled north of Japan, which he recorded in Oku no hosomichi (The Narrow Road to the Deep North). He died in 1694. The Narrow Road draws on traditions of diary and travel writing (nikki), but it is also the most famous example of haibun, a mixture of hai(ku) poem and bun(sho) prose. I am not sure if Basho invented this form, but it seems to me totally natural for a poet to include poems if he is writing about a journey, and doubly natural for a poet like Basho (who believed in the truth of daily experience) to write the everyday process of travel in prose: a concise, allusive, rhythmic sort of prose but still colloquial, full of activity and detail. Bruce Ross in How to haiku says that “haibun is prose writing that is expressed poetically, with figures of speech and rhythmic sound values, and is full of emotion, like the writing of a diary… sometimes the haiku will illustrate the insight of your narrative and sometimes it will extend the implications of your narrative”. Here are some examples of haibun to help you get a further sense of the form. Some of them are quite long – yours can be a lot shorter. Ken Jones’s “confessions of a part-time hermit in the Welsh hills”, Stallions Crag. Lynne Rees’s description of family, school uniform and young consciousness in ‘A Time Before’. Write and send us your own haibun and selected poets will be published on Young Poets Network and win one of our exclusive notebooks! Remember, haibun is a mixture of prose and poetry. In your haibun, describe a short journey to a local landmark or a spot that means something to you. Like Basho’s pilgrimages, it might have some connection with a poem or poet you like. Mix practical details (like putting on your shoes, whether you walk or take the bus, something about the weather…) with a description of your feelings and expectations, as if you were writing a diary. Try to show one or two people you meet and one or two places along the way, perhaps connected with an historical event like a battle or a famous witch. None of this has to be strictly true, but it must feel true, so the details should be convincing. Have your narrator stop from time to time, sit down or lean against a wall to look at something, then include, interspersed with the prose, the short poem he or she writes. This challenge is for poets aged 25 and under, from all over the world. The deadline is Sunday 29 March 2015. Send as many haibun as you like, in the body of an email, to educationadmin@poetrysociety.org.uk with your name, age and address. By entering, you give permission for Young Poets Network to reproduce your poem in print and online, though copyright remains with you. We will add you to the Young Poets Network emailing list – please let us know if you’d rather we didn’t. This contest is now closed. Thank you to all the poets who submitted work. 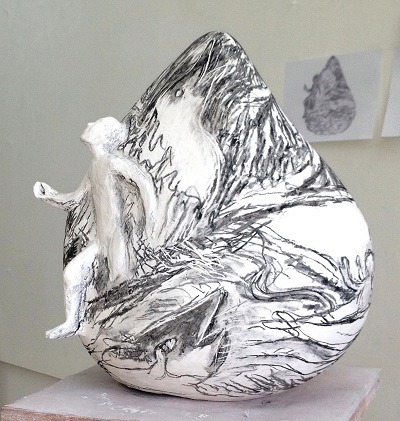 From 2 March – 25 April 2015, The Poetry Café in Covent Garden will be showing Sketches from the Poem Road, drawings and poems after Basho’s The Narrow Road. To find out more about poet Chris Beckett and artist Isao Miura, as well as various free events surrounding the exhibition (including a reading and discussion with the three poets above), visit the After Basho website. Could you elaborate more about the style and format of the poem? Hi Nijah, we’ve added some examples of haibun to give readers a further idea of the form – hope they help! Hi, can I send something I have published on my personal blog? Or should any entry be exclusive to this challenge? Hi Lisa, we do ask for new poems in response to our challenges – it’s great that you’ve been inspired to write haibun already, so hopefully you’ll be keen to do so again! Is it necessary to title our haibun? Hi Angelina, no need to title your haibun. Hi Lucy, it should be in a couple of weeks. when will the results come out? Hi Eunseo, the results will come out in the next couple of weeks. Usually we have around 4-6 winners. The prize is a very nice paper notebook! how many people can win the prize?? will the prize come to the school? Hi Eunseo, prizes go to whichever address the selected poets have provided.